Cheese & Crackers - Wisconsin Cheeses Hold Their Own! Suited up in our lab coats, hair nets, and shoe covers, our 20-odd tour group of cheese mongers and buyers stood entranced in the humid, warm air in the Chalet Cheese factory . 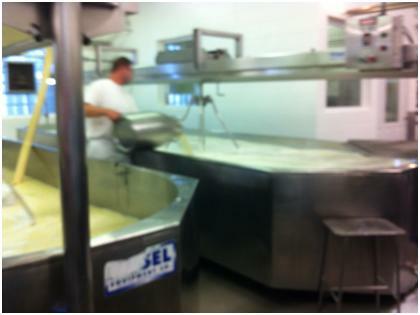 In front of us were three 125 gallon open vats of fresh milk being stirred by huge blades. A simple metal can held the crucial rennet solution that would turn this pasteurized milk into sturdy curds and protein filled whey, the start of a complicated, microbial, earthy process that will turn fresh, sweet milk delivered early in the morning to the Chalet factory into one of the world’s more smelly cheeses, the much maligned Limburger. Add a little jam, though, and even I could eat some aged German cheese! This was the beginning of the European Imports 2012 April cheese tour of Wisconsin specialty cheese factories, dotted along the rural landscape around Madison. Thanks to the hardworking dairy farmers in Wisconsin who put a little money in the pot for every gallon of milk they sell, the Wisconsin Milk Marketing Board (WMMB) has a nice little fund to bring cheesemongers and buyers to Wisconsin for in depth specialty cheese making tours. The four day, three night trip to Madison to visit cheese factories in the surrounding area was hosted by Pete Leur from the WMMB and European Imports of Chicago. Our tour included Upland Farm, managed by cheese maker Mike Gingrich; Chalet Cheese, where the US’s only Limburger is made, among other cheeses; Emmi Roth Kase USA, producer of fine gouda and other cheeses; Salemville Amish Coop, famous for its blue cheese made by Old Order Amish cheese makers; Crave Brothers, where the possibly the world’s best mozzarella and mascarpone are made at an energy efficient, green facility; Cedar Grove, another cheese maker specializing in pasture-fed milk cheeses in an environmentally friendly facility; and Carr Valley cheese, where a master cheese maker makes award winning creative cheeses. I came away with a renewed respect for artisanal Wisconsin cheese and an admiration for the cheese makers that have literally devoted their lives to the traditional art of cheesemaking. I had never seen cheese made before the tour. It is really an exciting experience to see the fresh milk, direct from the cow (all the milk delivered to the plants is used immediately and not stored in silos), being poured into huge open vats to be heated for pasteurization –or not, if the cheese being made is a raw milk cheese -- and then stirred to separate the curds and whey. 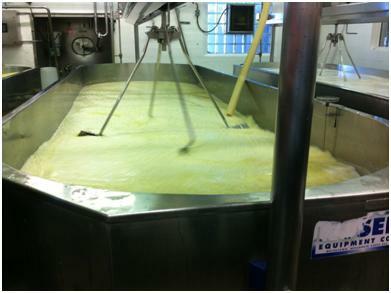 It was much more of a hands-on process than I expected, because although they do have large whisk-like blades to agitate the milk in the vats, the rennet solution, which coagulates the curds, is poured in by hand. Cheese makers are working with the cheese from start to finish, whether it be stirring, hand washing, or at the end, tasting the final product at various stages to see which might be good enough to age further into a reserve batch. We were able to observe the process of cheese making from start to finish at each facility, which did vary depending on what kind of cheese they were making – Crave Brothers Farm makes fresh mozzarella, which means the curds are formed and packaged almost immediately from the raw milk, as contrasted with Upland Cheese or Chalet Cheese, which do washed rind cheeses that need to age in the affinage (cheese finishing) rooms, or caves. The temperature and humidity are carefully controlled in these rooms, so the cheese can thrive, just as they would in a natural cave. 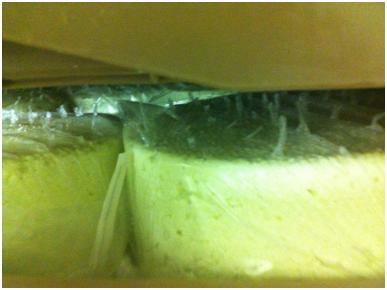 Cheesemaking is a smelly process. Busy bacteria do their job to ferment the perishable milk into a stable product, and the cheesemakers steer them in the right direction through careful management of the process. From the warm, fresh milk smell to the strong ammonia of cheese aging in caves, it’s a very sensory experience to turn a raw product into a fine specialty cheese. The intense smell and even feel of the ammonia from the fermenting washed rind cheeses in the affinage rooms was a new experience for most of us. It is almost unbearable for the uninitiated to stand in the humid, ammonia soaked air as the wheels or loaves of cheese ripen in their racks. 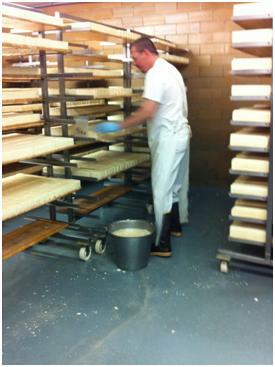 That’s a good smell to a cheese maker, because it lets them know the cheese is forming into good stuff to eat. 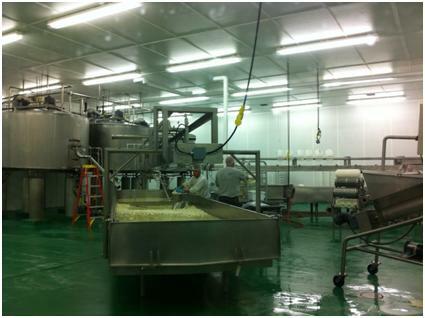 I found that “factory” was one of those words that is a slight misnomer in Wisconsin specialty cheese making. The word factory brings up images of sophisticated mechanization and dehumanization, and these places are anything but. Of course, the process of cheese making is streamlined, but so much of it is done by hand and feel by the cheese makers, so “factory” takes on a different kind of meaning. These factories have very little turnover – the Chalet Cheese manager […..] has been there 20 years, and the manager before him 30. It seems to be repetitive work, cutting, turning, and washing each cheese by hand, but if the longevity of the employees is any indication, they do enjoy what they do. Although most places still have a hands-on approach, many repetitive processes have been automated. At Emmi Roth Kase USA, the cheese is pressed into loaves by machine (as opposed to some places that stack metal weights on by hand or place the cheese in metal boxes), and turned by special robots that lift, dip in brine, and replace thousands of loaves of cheese stacked in rows 20 feet high in the curing rooms – making the production more consistent. The robots, all specially made in Switzerland, have been named by the employees, who have gone from turning and dipping the cheese to commanding the robots to do it for them (no jobs were lost, we were told). At first, there was an idea that they could name the robots after the Swiss-born Roth brothers, but when it was clear they might be calling them a bad name or two if they broke down, that idea was quickly abandoned, and now the machines are nicknamed “Pete” and “Heidi,” among others. Despite these advances in automation, the majority of the process is still very manual, even at Emmi Roth USA, probably the most automated of any factory we visited. 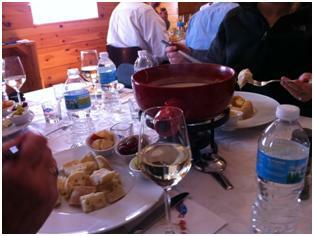 At the Chalet Cheese factory, all the cheese is washed by hand. 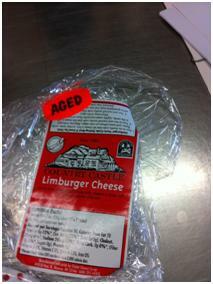 The only machine in evidence is in the small packaging room, imported from Switzerland to wrap the Limburger in the correct Swiss style (the cheese has to be able to breathe). There was never a sense that the machines had replaced the human touch; technology was helping, not making the process soulless. The cheese makers were well prepared for visitors to the factories. 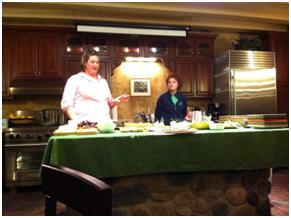 Emmi Roth, Crave, and Cedar Grove had viewing walls built into their factory facilities. 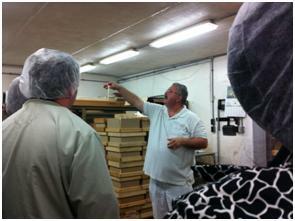 At Chalet and Salemville, we suited up fully and went into the cheesemaking areas. 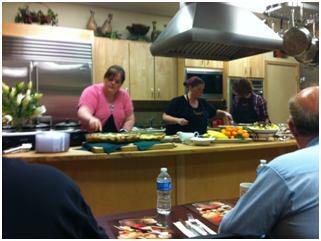 Each had samples for us, but at Crave, Emmi Roth, and Carr Valley, we were treated to lunches prepared by professionally trained chefs in gleaming kitchens demonstrating how to use their cheese products in various dishes. Americans love cheese in food, and our cheese factory hosts pulled out the stops to serve dishes that were creative and delicious in their state of the art demonstration kitchens. We were treated to a strawberry and mozzarella ball salad, mascarpone and caramelized onion pizza, and chocolate mascarpone cheesecake at Crave Brothers; at Emmi Roth, a pot of mixed gruyere fondue, with a complementary glass of Kirshwasser liqueur, capped off by melodious yodeling demonstration by our Swiss-born host; and at Carr Valley, a cheesy breakfast using a sheep’s milk blue in a strata, and black truffle infused cheese cooked with asparagus and eggs. At least in Wisconsin, the dairy industry seems to be moving in a positive forward direction. Old factories, long abandoned during the heyday of processed cheese food are being reopened and put to work. At Salemville, the Amish community has reopened their community cheese factory to make quality blue cheeses; Cedar Grove is opening a new factory in one of the poorest neighborhoods of Milwaukee; Upland and Crave Brothers have found real success with newly built facilities tailored to their respective styles and production needs. Dairy coops have a place to send their RGBSt-free milk, and it is possible to sustain a family farm using pasture rotation feeding because the cheese market will support it. Centuries old traditions dovetail with new production techniques in modern cheesemaking. Advances in dairy science have made it possible to bring dairy production to a level where the raw product is completely understood by cheesemakers to such an extent that the milk itself determines the style and taste of the end product. In the past, cheese was made from whatever cheese was at hand; Alpine cheeses were made right on the mountaintop from the morning milk at hand, or Morbier with the morning and evening milk in two layers separated by ash. There is no guesswork on the raw milk that goes into cheese in modern cheese making; every aspect of the milk is tested and analyzed for chemical composition and flavor profile. The end result is a consistent, quality product that tastes delicious and makes stellar cheeses, but can still draw on the traditions of fine cheesemaking. The new breed of cheesemaker is interested in not only making award winning cheeses, but the how milk and cheese production impact the community, and the surrounding environment. Crave Brothers are now famous for their innovative manure digester, which takes the methane from the manure produced by over 1000 cows and makes biofuel, enough to power much more than their own farm and factory, as well as creating a byproduct of potting soil and bedding for their cattle. This allows them to house and feed that many animals necessary for their cheese production and make a positive carbon footprint. 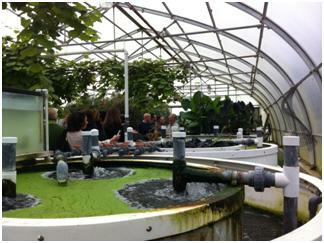 Cedar Grove, another green farm, has a system to clean their wastewater (a huge amount is produced when making cheese) using an innovative system of tanks of algae, which cleans and recycles the water naturally in a beautiful greenhouse. The pasture grazers are passionate about sustaining their cattle on what the land can provide, rather than feeding stored rations that take energy to produce. The national movement to recognize slow food, and responsible eating, has been embraced by many of the cheesemakers in Wisconsin, and the result has been nothing but positive. Even whey, the byproduct of all this cheesemaking, is finding a market as a high quality protein source. Our American tradition of cheesemaking comes from the immigrants from Europe who brought it with them, but this new generation of cheese makers have taken the best of the European traditions and put an American twist on them, producing both traditional cheeses such as Alpine-style raw milk and Limburger to sweet vanilla bean infused goat (Carr Valley’s Vanilla Carbona). American cheese makers aren’t afraid to reinvent a raw alpine style cheese, make a manchego from cow’s milk, take a riff on a gouda, or smoke just about anything over applewood – fontina, blue cheese, cow, goat, or sheep. If an Israeli brings a water buffalo herd to rural Wisconsin, Cedar Grove will make water buffalo cheese. These master craftsmen and women love to shake it up, mixing milks and rubbing cheese rinds with everything from cinnamon to coffee. If it tastes good with cheese, American cheesemakers put it right in the wheel – chipotle, bacon, vanilla bean, herbs … there seems no limit to American inventiveness. American consumers want good cheese, it seems, and the more complex and interesting, the better. Specialty cheese factories are thriving. The availability of specialized technology and modern farming techniques allows each farmer and producer to make informed, specific decisions about the type of cheese they want to bring to the consumer, taking a centuries old tradition to a new level. Whether a pasture fed product or one that comes from a farm that uses milk produced through scientifically formulated rations, each has a tremendous amount of merit and good taste. 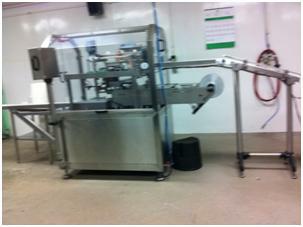 No matter if the cheese is turned by hand, or a robot named “Pete,” cheese making is very much a labor of love at these specialty cheese factories, with much pride going into the production. I predict we will continue to see more world class quality cheeses out of Wisconsin that can go head to head with European offerings. Cheese & Crackers carries a full line of Wisconsin Cheeses from the finest artisanal producers in the world. We travel every single month to seek out the finest food on earth. Stop by and see what's new. We add new cheese every week.